The week of November 14 – 18, hundreds of American University students explored innovation and entrepreneurship during Global Entrepreneurship Week (GEW). GEW is a worldwide celebration of the innovators who launch startups, drive economic growth, expand human welfare, and bring ideas to life. The incubator offers students and recent alumni a place to work on businesses and social impact ventures by providing a 24/7 on-campus workspace, access to other entrepreneurially-minded students, and coaching from experienced faculty advisors. 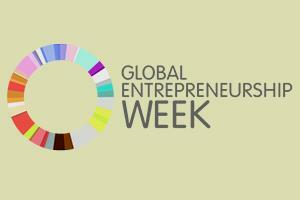 Last year, American University’s inaugural GEW ranked 1st among D.C. area universities. The week is an opportunity for undergraduate and graduate students to showcase their own innovative ideas, as well as learn from successful self-starters. This year’s agenda included sessions on sports and entertainment, biotechnology, and social entrepreneurship. Lauren Maillian, the host of “Quit Your Day Job” on Oxygen, and Deon Jones, the Digital Marketing Project Manager at The Oprah Winfrey Network, hosted one panel. They spoke to a packed house, including many freshmen and sophomores who were excited to get industry insight. In the talk, Jones explained how his undergraduate degree from AU and internships in politics prepared him to work in the entertainment field. The range of skills he gained as a student at AU made him a well-rounded professional. He also explained that business, while not governmental, is political as well. The structure of business, and qualities that fair well in politics, like leadership and interpersonal skills, can be applied to the business-world. The week concluded with the announcement of “The Big Idea” winner. The Big Idea is a campus-wide video pitch competition where students develop a two-minute video explaining their solution to an unmet social or commercial need. This year's winning idea was "Sand Scan" by Matt Mullin. Mullin was awarded $2,000 to jump-start his idea of using drone technology to track beach erosion.